Since the begining of November 2015, I have managed to work just three VK stations. A sad reflection on a 20m band, which for a couple of years had provided me and indeed many other Activators and Chasers with hundreds of DX contacts, especially VK chaser and VK s2s contacts. During 2014//2014, I would usually be QRV on a summit at 0630 local time listening to the European Chasers working the VK Activators. Although I could not hear the VK Activators/Chasers, I could hear the Europeans working them, and I knew it was only a matter of 10 minutes or so before the band would suddenly open into G and my CQ would be answered by both VK chasers and of course, VK Activators, with those lovely words “summit to summit!” What a buzz working a VK Activator 10,000 or more miles away, many of them, who were running QRP. The bitterly cold winter mornings didn’t deter me either. With the prospect of leaving a summit with 15 to 20 and often more VK contacts in my log, the freezing conditions went to the back of my mind, as I was frantically scribbling DX callsigns into my log book. So, Wednesday morning, I tried to recreate the same scenario from Gun G/SP-013. However, the SFI was well below 100 and I knew that working any kind of DX was going to be very hard work. When it comes to activating, I’ve always taken the view, no pain, no gain and that’s why I’ve kept faith with the absurdly heavy Antron-99. The A-99 has been an outstanding SOTA HF antenna, with nothing else I’ve used, even coming close to its performance working 20m thru 10m. Despite its wonderful performance, I’ve hated carrying it and the associated **** needed, on every activation. This was my first early morning activation for quite some time and I found myself QRV on the 20m band at 0551z. However, it took me ten minutes to find my first contact, Jan OK2PDT. Just two minutes later, Jan was followed by Rick VK4RF. Rick, also worked me under his second callsign VK4HA. State to work from a SOTA summit, I’ve only logged 15 other VK4 contacts all through the boom times, so to find 3 on an activation from the UK, was something special. After two and a half hours hard work, I had just 33 contacts in the log. Thanks to Dave M6RUG for a nice ground wave contact. Quite frankly, half a dozen VK contacts, was a good result on a 20m band that is pretty poorly. It’s sad to think, that things are going to get worse before they get better. Well done Mike, that is surprisingly good going. 15m and 17m have definitely changed for the worst. Looking forward to the Winter again, when conditions should improve. Over the last week or so, I have been hearing, at least bits of VK stations via Long Path. Often earlier that I thought they should be. I worked VK4ALX (Alex) and VK5HX (John) on May 1st between 05:30 and 06:15 UTC. OK, these were not SOTA stations and not even QRP stations but after so many months of hearing nothing out of VK on 20m, this to me appears to be at least a partial improvement. By the way I can usually hear a lot more from a summit than from the home QTH, so I should have been out on one on the 1st. Isn’t Hindsight a great thing! Thanks for the contact Mike - it was only much later that I realised I had made the contact with you on my vertical rather than my beam. Contacts into EU over the last couple of weeks have been typified by very variable conditions as well as extremely deep QSB. Have worked some M6 mobile stations as well as some of the usual pedestrian portables, sometimes at genuine 59 strengths both ways! Thanks for the call this morning. After a modicum of success, working some DX on Wednesday, the temptation was just too much and I set my alarm clock for 0430 local time and set off for Billinge Hill G/SP-017 at 0500 local. Arriving at the parking spot at 0600 local time, I figured I was going to be far too early for any DX. Nevertheless, I took the gentle 15 minute stroll to the trig point and bungeed the A-99 to the fence. What a fantastic morning, dry and warm with no wind! Has summer finally arrived? At 0550, I self spotted and no more than 30 seconds later, I was pounced on by EA7PY. Ukraine and another EA station followed him straight in. Next into my log, was Steve VK7CW, with a nice signal from Tasmania, who qualified the summit for me. Ernie VK3DET followed Steve in. It’s been some time since I last worked Ernie, and so we had a quick natter. Tony VK3CAT, followed Ernie into my log, many thanks for the chat, Tony. Once again, good to hear Matt VK1MA making the trip. Matt was then followed with quite a run of EU contacts. It was nice to hear Ron VK3AFW call in, it’s been some time since we worked, but I recognised his voice immediately, many thanks for taking the time to call me, Ron! A couple more EU contacts were made and then I heard a “summit to Summit” call from Andrew VK1MBE/P activating VK2/SM-053. Rather interestingly, of the 11 SOTA contacts Andrew and myself have made, 10 have been s2s! Can’t remember the last time I logged a VK s2s, so this made my morning. The EU Chasers were on song and plenty were making my log, before I received a call from Paul VK5PAS with a big signal. The final bit of DX for the morning was John VK2YW from Wagga Wagga NSW, with signal reports of 5/1 5/2 exchanged. I carried on logging European contacts, until my final call of the morning, a s2s with Axel DM2AXL/P up on DM/BM-165. Finding DX is still not easy, however, the 20m band seemed to be in slightly better shape than Wednesday. 80 contacts for the activation. Just thought I’d nip up to G/SP-013 Gun and perform an autopsy into why the FT8 s2s day was such hard work from G and no VK contacts were logged! I’ve been lead to believe that a 100mW rig powered by nothing more than a Fishermans Friend would easily make it to VK working the FT8 mode. Clearly, not the case on Saturday. Anyway, this morning, VK3, VK5 and VK6 worked with nothing more than a mic and home brew inverted Vee antenna. 5 continents logged, just couldn’t be asked to wait for South America, too cold. 65 contacts logged, all 20m ssb. Good going, Mike, well done! Thanks for the flowers, Guru. 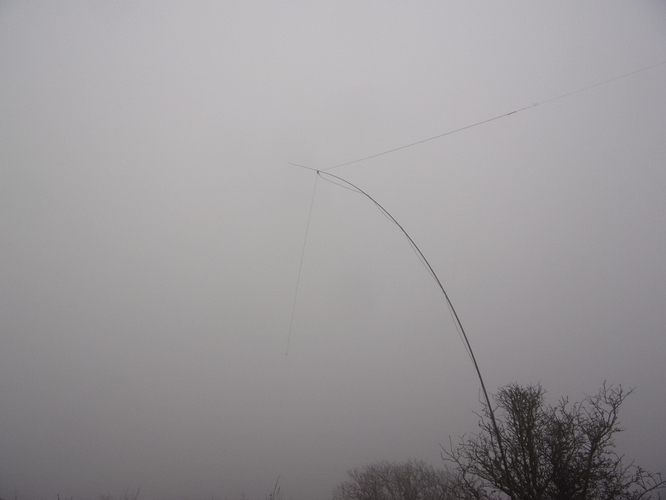 The wind made it difficult to get my antenna to full height, so I had to settle for about 8m above the ground. It’s because you did it from Gun Mike. It’s much harder from The Cloud. From my today’s chaser point of view, conditions were not bad during my lunch break time. The key thing is do never stop trying, as you brilliantly do. Maybe this proves Mickey that FT8 is not the easy mode you think it is and also I think some people in the UK/EU like to have the challenge of working VK/ZL summit to summit on FT8 and visa versa rather than the easy option of doing this on SSB. Hi Hi - nice joke Jimmy! Realistically the difference was propagation and timing. There is no point trying ANY mode on a band above where the MUF currently is, which is what it seems several amateurs tried last weekend - of course without knowing what the MUF is for DX at the time, all one can do after driving for two hours, climbing for 45 minutes, setting all the gear up for 20 minutes IS … try and hope to get through… Sometimes it works, sometimes it doesn’t. Today Mike was professional in his set up and despite the cold waited for the correct time and what helped was pre-auroal enhancement of propagation (I believe). I’ve already told Mike via PM, I don’t think I’ve EVER worked 5 continents in one activation - even when the band conditions were great!! So well done Mike and well done for trying to all those who went out last Saturday. Well done on making those VK contacts on Saturday, presumably via short path. The VKs you are working are contest grade stations. VK5PAS has 5 elements, VK6 is a big club station, etc. It’s a lot harder to make S2S contacts with a station on a dipole, regardless of mode. On Saturday I set up on VK3/VE-030, the same summit as Compton VK2HRX and tried to make EU contacts on 20m CW. No-one in EU was heard. I did make a S2S with JJ1SWI off the side of the antenna so was very pleased with that! Compton had technical issues and was unable to transmit on FT8 however Wade VK1MIC was operating OK on the adjacent summit. Doesn’t matter the mode, if there’s no propagation nothing will work. Seems as though short path at 1100z is currently more reliable than long path at 0700z. Problem is that 1100z is 10pm local so on Saturday we were all back at the lodge in Mt Hotham sinking cold ones by then. The bad news is we still have a couple of years before hitting the bottom of the solar cycle so you may have to be content to work contest grade VKs for a while yet. The contacts were made between 1130z and 1300z on Tuesday 05/02. I’ve worked Ernie VK3DET on my last 7 or 8 short path activations at just after 1100z. Not this morning though. The band opened a good 30 minutes later. As the band moves from East to West, the window to make VK contacts is small… QSB is the DX Activators biggest enemy. I have done quite a bit of listening SP on 20 metres from 11:00 to 13:00 UTC and Mike 2E0YYY is the only one I can hear and work on a regular basis. I do have the use of my local radio club remote station. It has a Steppir antenna about 60 feet. Can hear some chasers working other European SOTA stations but can never hear them not even on CW . SP, band seems to close about 13:00 UTC which is 9pm local in VK6. Will try and do a night time SP SOTA activation soon, But climbing summits in the dark and setting up is not easy. Plus with 35-40C temps" during the afternoon, does not making hiking in to the campsite appealing. Only one or two Summits that have a campsite nearby so choice is limited. LP from a summit, its nearly 12 months since I worked LP The EU/VK Day in March. By the way is the EU/VK/ZL/JA day happening again in March this year. I have worked more s2s with G stations than I have with VK6, so I am always keen to chase / s2s with you and your western summiters. I think we all need to remember that one swallow does not make a spring. The conditions found on one day can be completely different on the next. We simply cannot extrapolate from last weekend to this, as was quite reasonable in 2012/3/4. All we can do is try and see what happens, after taking all reasonable efforts to use appropriate power, decent proven antennas and operating at the right time of day for the path we expect or hope to work. Anyway as others have already said, well done Mickey for making those contacts and persisting despite the doubts about the conditions. Would have been delighted to hear you before 0830 when we closed down (with Brian saying “we are late for dinner, close down, pack up and get off this hill!”). But it was not to be.